On November 27 we deployed a change to travis-ci.org that exposed private repository keys (used for encrypting sensitive data in .travis.yml files) via an undocumented and unannounced API endpoint. Travis CI for private repositories was not affected by this issue. This endpoint has been requested for 18 repositories before we were notified about the issue on December 2nd. From examining the access logs these requests looked like legit requests, but we still decided to come forward with this issue as anyone could’ve accessed those endpoints. We have immediately disabled the endpoint and inspected the relevant access logs in order to estimate possible damage. We have since regenerated the keys on the affected repositories, contacted repository owners and added a way for people to reset their keys manually. Our API code generates JSON payloads using service classes that in turn use plain Ruby JSON generator classes, i.e. we do not rely on ActiveRecord’s to_json method normally. Now this particular endpoint was missing a single method call that made it so that ActiveRecord’s to_json magic kicked in and the default logic generated the JSON payload including all attributes on this model. Thus, the private key was included in the payload. How will we prevent such incidents in the future? We have a number of changes lined up that will make sure we can not run into something like this this easily again and we will implement them as soon as possible. Some but not all of them include: encryption of this data in the database, removing the ActiveRecord related logic that magically converts models into JSON, adding extra safety nets on the API in order to make sure that generated JSON payloads never contain keys named private_key, password or similar. How to re-generate your repository key? Although the vast majority of repositories were not affected, we rolled out a new feature that allows you to regenerate the keys for a repository. If you’re worried about security of your data you can reset your keys. 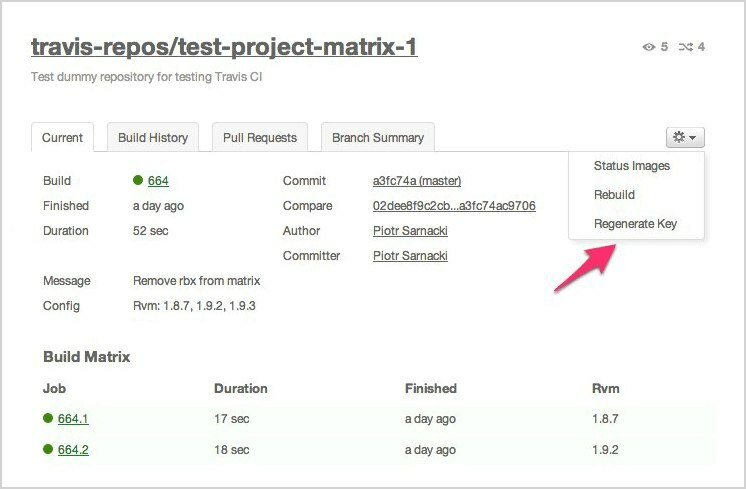 In order to do that, log in to https://travis-ci.org, go to your repository, click on the cog icon on the right and choose “Regenerate Key” option from the menu. We’re very sorry about this issue. We’re very concerned with the security of our users’ sensitive data. Even though we have talked to the maintainers of all affected projects and though to the best of our knowledge, no harm was caused, this should never happen again. If you have any questions or feedback regarding SSL keys or security in general, please email us at support@travis-ci.com.